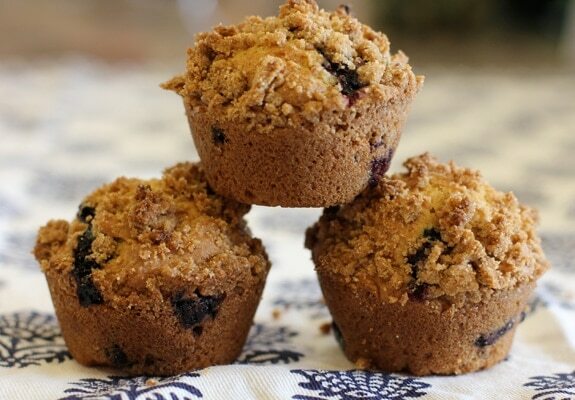 I wasn’t going to share these gluten-free blueberry muffins w/ streusel topping with you today. But once I made these gluten free blueberry muffins this morning, I knew it wouldn’t be fair to NOT share them with you. The recipe comes from Gluten-Free Baking Classics by Annalise G. Roberts. It is one of the first gluten-free cookbooks I ever bought, and still one of my favorites for gluten-free baked goods and desserts. I’m not sure if it’s the touch of nutmeg, or the streusel topping, but there is something really yummy about these muffins. I hope you try them and let me know if you like them as much as I did! Preheat oven to 375 degrees. Position rack in center of oven and spray muffin pan with cooking spray. Combine milk and oil in a small bowl. Beat in eggs and vanilla. Add liquids to blueberry mixture and stir until just blended. Stir in fresh blueberries, or divide batter in half and add 3/4 cup chocolate chips to half the batter and 3/4 cup blueberries to the other half. 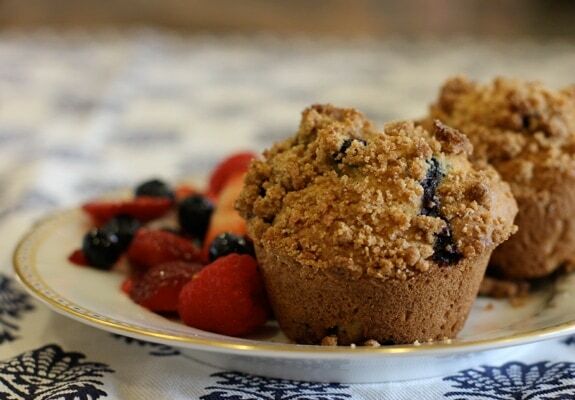 Fill muffin tins 2/3 full and sprinkle with Streusel topping. Bake18-25 minutes until light golden. Remove muffins from pan and serve immediately or cool on rack. Combine all ingredients until well blended. You can store any remaining flour in the refrigerator, and you can also double or triple the amounts to have extra gluten-free flour on hand. Combine flour, brown sugar, cinnamon, and xanthan gum in a small bowl; stir to blend. Pour in butter and stir until all dry ingredients are moistened. Break into small pieces with spoon. Enjoy with fresh mixed berries and a steaming hot cup of coffee or tea! What did you have for breakfast this morning??? 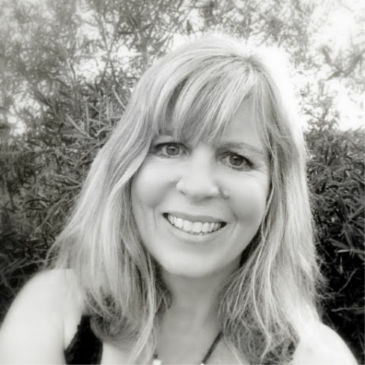 Fun Friday: Gluten-Free Book Review, Sardine Tasting Adventures, and More! thank you for such a great recipe. I am sending gf muffins to camp with my son and it worked great. I doubled the recipe and made blueberry and apple,cinnamon sugar muffins. Your recipe for AP flour is about the simplest I have found yet, and I am pleased with it for this use. Can’t wait to try another recipe with it. Thanks again! Hi Cindy, You’re most welcome and thanks so much for sharing your delicious experience with me-I’m glad you and your son enjoyed the muffins! I love your idea to add apples as well-will definitely try this the next time I make the muffins for my family 🙂 Cheers! So glad you decided to share, those look amazingly good! My breakfast smoothies are not quite as exciting although pretty tasty. Thanks Sylvie! I usually only make muffins/baked goods for a weekend treat. Smoothies are often my b-fast choice as well! Wow these look great and your food photography is gorg! oh! How delicious do these look!!?? Thanks for sharing today! They look fabulous EA!! Mouth is watering now!! Thanks so much fr all your comments. Xiaolu-Yep, I use the brown rice flour and sorghum to make it a little healthier. You can also try some quinoa and or millet flour as well. Wish I were in DC to try your cupcakes! 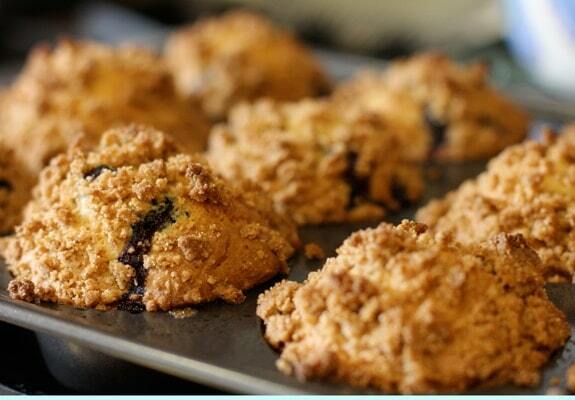 These look every bit as good if not better than blueberry muffins with regular flour. Do you use the brown rice flour in your mix to be healthier? Could white rice flour be substituted and still have good taste/texture? I’m trying to test some GF cupcakes because I’ve gotten some requests. Thank you too for retweeting my post friday, what a heated debate- lived it. It would have been mean to withhold that from us. They look great. I need photography tips from you too because your food looks so alluring all the time. I didn’t have breakfast yet, off for a run. I plan on testing out a tarragon?? smoothie. A twitter friend suggested it. We’ll see, muffin may be a safer bet. They look gorgeous! That topping! i am in love with gluten free baking lately. these muffins look scrumptious! love the streusel topping :D. i would love to try and veganize this recipe! Those are the MOST photogenic muffins I have ever seen in my life! Gorgeous! 🙂 And I bet they were delicious as well! This muffins look amazing! Yum! On the weekends, I try to limit my computer time, but I always just love to see what my favorite bloggers are up to!